Fritters as you like them. Fritters to taste. Free fritters. Fritters freed. Japanese pan fried pizza. Savory pancakes. DIY fry-up. Griddled Goo. Individualistic johnnycakes. Selfish savories. Preference, predilection, prepossession, propensity, personalised or pet pancakes or paste. Pet preparation. Wished or whimsy waffles. What you will waffles. (Free)Will waffles. Flavour Flapjacks. Groove griddle cakes. Number one gunge, My cup of tea cakes. Croquette my way. Darling, dearest, desired, or druthers doughboys or dumplings. Liberty cakes. The cook is on holiday cakes. Be my batter cakes. Beloved batter cakes, Coagulated stir fry. Callous cutlets. 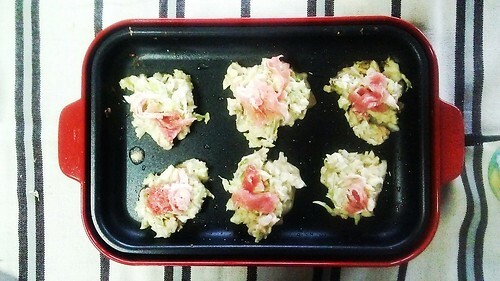 Choice cabbage cakes. Liking or Love lump cakes. Main mush. Choice Concoction. My mix. Pan fried partiality. Pan-fried perfection. Caprice cakes. Hobby hotplate. Free-style fries. Fried fantasy. Freedom fries. My fry. Favourite fries. Hashed heaven. Hashed happiness. My students always 'translate' the name for Japanese foods such as that pictured above (お好み焼き) using their phonetization, "okonomi yaki," which might just as well be kowwash firdight for all the meaning it would impart to the average anglophone. This is I think because people hate meaninglessness (Heine, Proulx, & Vohs, 2006) so if at least one word in Japanese is included in any sentence the sender knows that at least that one word will be meaningful in a Japanese context, and that their conversation partner will have some idea of what they are talking about. The reasons for this is anatta or no self. The self is just a representation (story or image): something with a meaning. The lack of meaning is self-annihilation, and English conversation practice almost deadly. I need to be nicer to my students, investigate Japanese hospice praxis, while insisting that students use non-phonetic translations. Addendum Good Paper on Japanese hospice praxis emphasises the use of image-based measure (PAC analysis) rather than scales. Recommends, in addition to palliative care and listen: smiles and improved personal hygiene and health on the part of the carer. I try to always attend conversation class wearing a business shirt and tie. 内藤哲雄1997／2002PAC 分析実施法入門［改訂版］「個」を科学する新技法への招待ナカニシヤ出版 amazon link a student gave a presentation about this. I thought it came from outside of Japan. 内藤哲雄. (1997). PAC 分析の適用範囲と実施法. 信州大学人文学部人文科学論集< 人間情報学科編>, 31, 51-87.